Only for the LI-ETH and XnTcp sub library. The hostname must be a TCP/IP address or a solvable DNS name. The LI-USB manual says to use no hardware handshake, but if buffer overflows are encountered or unexpected communication errors it is recommended to set this to CTS. Uncheck the handshake if the no communication is possible. Lenz LI100 LI101F default RS232 Interface Sensors are not reported! ¹) Depends on the device driver and operating system; Runs well with activated handshake under Mac OS X Lion. ²) Replaced by Lenz interface 23151. The default startup power state is off. You can change this behavior by checking this option. 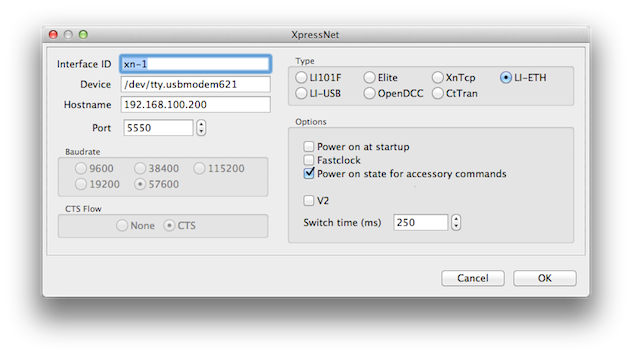 Some XpressNet Command Stations, like OpenDCC, are supporting the fast clock operation. Check this if Rocrail should send this command every layout minute. The LZV only have a small buffer for stacking accessory commands at power off. It will reply with "Busy" messages if there is no more room for more commands. Check the position of all switches after power off on a ghost train event in automatic mode before turning power back on. Locomotive address is in the range 0 to 99. Time in milliseconds between on/off. Where the XpressNet address is the address of the module in the range of [1..128] and port refering to the input connector [1..8] of the module. Thus, the first sensor module has address 65 in XpressNet and the address of the first sensor of the first module in Rocrail is 512! You can set up the address in Rocrail style, or else in the more cool PADA Style. In this way the address of the decoder will match with the address in your LH* handheld. To activate polling throttles for updating Rocrail clients this option can be set for each induvidual loco: Poll info.